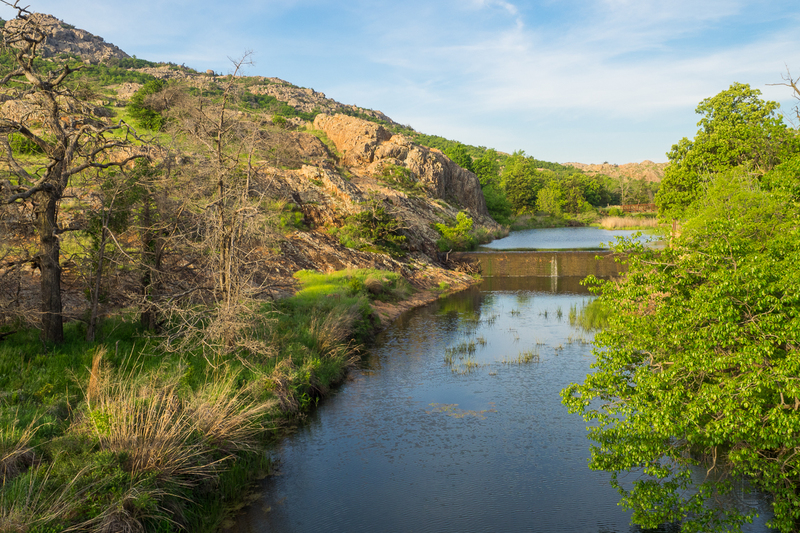 Wild, rugged, and weathered — the Wichita Mountains Wildlife Refuge in central Oklahoma is a symbol of the old west standing at the threshold of modern times. The natural attractions of the refuge are many and varied. In addition to viewing and photographing wildlife in their natural setting, visitors find the lakes, streams, canyons, mountains and grasslands ideal for hiking, fishing, and other outdoor activities. Elk Mountain lies within the Charons Garden Wilderness Area in the western corner of the refuge. You may not think of rocky-topped mountains when you envisage Oklahoma, but this 3-mile hike to the summit may surprise you with its challenging terrain. My brother Dave and I visited Wichita Mountains on Saturday, May 2, 2015 from 7:00AM to 1:30PM. Our plan was to climb to the top of Elk Mountain to survey the refuge, then return to explore the areas that looked interesting from the summit. Hike Rating: Moderate. You will climb 600 feet in a little more than a mile. Trail Condition: Primitive and rocky, but easily followed. This is designated wilderness, so don’t expect any signs. Starting Point: Sunset parking area. Entrance to Charons Garden Wilderness. Trail Traffic: Our early arrival enabled us to enjoy the climb nearly by ourselves, but this was a beautiful Oklahoma weekend, so we encountered dozens of others out to savor the day on our way back down. How to Get There: From Lawton, OK take Hwy 62 to Hwy 115 (Cache exit) north to the Refuge Gate. The Visitor Center is at the intersection of Hwy 115 and Hwy 49. To get to Elk Mountain, take Hwy 49 west 6.6 miles to the Sunset Picnic Area. The trailhead for Elk Mountain is at the entrance to Charons Garden Wilderness. No sooner had we entered the Wildlife Refuge than we were greeted by a couple of Texas Longhorns and a big ol’ bison bull grazing in the morning sun on the lush grassland beside the road. I knew right away, this was going to be cool! The Wichita Mountains National Wildlife Refuge near Lawton and Fort Sill, Oklahoma was first established in 1901 as a Forest Preserve. In 1905, it was redesignated as the Wichita Forest and Game Preserve. Congress designated the Wichita Mountains a National Wildlife Refuge in 1936. The physical environment includes mixed prairie grasslands, with buffalo and grama short-grasses and bluestems, Indian grass, and switch-grass tallgrasses. Several mountains and rock features appear within the refuge, with Mt. Scott as the highest point at 2,464 feet. The Civilian Conservation Corps was quite active in the Refuge in the 1930s, constructing a number of lakes, roads and trails, and the 8-foot-high big game boundary fence around the 59,000 acre property. The establishment of a national preserve in southwestern Oklahoma culminated a regional movement to protect the shrinking bison population. In 1907 15 bison were brought back to the southern plains by railcar. Twenty elk were introduced in 1911, and in 1927, 30 Texas longhorns found a new home on the grounds of the Refuge. All of the herds have grown, and are still thriving today. The Refuge has 15 miles of designated hiking trails that offer something for the complete novice, and for the seasoned hiker. The trails wind through scrub oak forest, across rocky mountains, and over grassy prairie. Wildlife abounds throughout, so a new thrill may be just around the next turn. The Dog Run Hollow Trail, a part of the National Recreation Trail System, has trailheads at French Lake, Boulder, Lost Lake, and Dog Run Hollow. You may choose a 1-,2-, or 4-hour hike through some of the more unique areas of the Refuge. But the one we chose to begin our day was the Elk Mountain Trail in Charons Garden Wilderness. I had read, when planning this adventure, that you could see the entire Wildlife Refuge from the summit of Elk Mountain. To me, that seemed like a great way to check out “the lay of the land,” so to speak. We could enjoy a shortish morning hike, and perhaps get an inkling of the other areas of the Refuge we might want to visit later. The Congressionially designated Charons Garden Wilderness Area offers hikers an opportunity to test their skills in challenging terrain. In keeping with the wilderness designation, the trails are primitive and can be confused with game trails. Be prepared before you enter any wilderness area. Carry adequate water, wear sturdy shoes, and allow extra time for the rugged and often confusing conditions. This shot is just past the trailhead, of Headwaters Creek, a stream that runs past the park headquarters and into French Lake. As Dave and I began our trek up the Elk Mountain Trail, we were treated to an abundance of Spring wildflowers basking in the golden glow of the early morning sunshine. Mostly bright yellow balsamroot, and blue and purple spiderwort, these exciting blossoms filled the nooks and crannies of the rocky terrain and small, grassy meadows. So too did the prickly pear cactus, something neither Dave nor I expected to find in the plains of Oklahoma. The pathway is indeed rocky, but we never experienced any difficulty staying on trail. You do ascend the entire way, but never at a steep enough pitch to cause dire huffing and puffing. We found the climb up Elk Mountain to be glorious. The higher we got, the more the surroundings opened up. I have to admit total ignorance when it comes to familiarity with the geology of Oklahoma, but this was a complete surprise to me. When we first saw the mountains from 50 miles away the evening before, we wondered how this happened. These pockets of granite summits 2,000 feet high are scattered about, surrounded by flat plains as far as the horizon. And lakes. The CCC built 15 dams within the Refuge creating picturesque, crystal-clear reservoirs throughout the reserve. It seemed with each hundred feet we climbed, another lake would come into view. The entire area was stunning. The golden hour just past dawn certainly helped with the mesmerizing appearance, but this refuge is one beautiful place. Also, the higher we climbed, the more the vegetation changed from grass and scattered wildflowers to scrub oak. I can imagine the upper portions of this trail are a seasonal delight in Fall when the oak assumes its many shades of yellow, orange, and scarlet. It ain’t half bad in Spring either. If any of the Oklahoma natives who may read this know if the Wichita Mountains get snow in Winter, please let us know in the comments section below. Snow would create an even more awesome landscape. It is 1.1 miles from the trailhead to the summit of Elk Mountain where the trail ends. However, Elk Mountain has a rounded crest that is probably at least 40 acres in size. Dave and I spent 30 minutes exploring the summit and just barely began to scratch the surface. You could spend several hours up there, and enjoy every minute. By now, other hikers were beginning to join us at the top, an early indication of the influx that was to come during our descent. The timing of our trip across the country just happened to put us at Wichita Mountains on a Saturday. As we discovered on our way down the mountain, this is a very popular place. There were scout groups and church groups, families with youngsters, and geezers like ourselves out to enjoy a memorable wild place. We noticed it too later in the day at the Visitor Center, as the parking lot was nearly full. So, you may want to plan your visit for a weekday. On the way down we were also entertained by the United States Air Force. The sound of military jets in the sky is unmistakable. Either from Altus Air Force Base just west of Wichita Mountains, or from Tinker Air Force Base in Oklahoma City, several fighter jets were creating man-made thunder that reverberated off the granite of Elk Mountain. Piercing the sky on a straight-up climb, or pirouetting around a puffy white cloud, these guys were out for a Saturday play day just like us. Lawton, OK is also home to Fort Sill, the only remaining active Army installation of all the forts on the Southern Plains built during the Indian Wars. Best Hike To summarize, Dave and I had a thoroughly enjoyable two hours climbing and exploring Elk Mountain. This is a four-season, family-friendly excursion that took me completely by surprise with how wonderful it is. In fact, I’m giving the Elk Mountain Trail in Wichita Mountains National Wildlife Refuge a Meanderthals Best Hike designation. The vistas are stunning, the wildlife engaging, the lakes refreshing, and we also had very positive experiences with park personnel at the Visitor Center. If you’re traveling I-40 through Oklahoma, it’s definitely worth your while to get off the highway and visit Wichita Mountains. By the way, after you take a look at the photo gallery below for our hike up Elk Mountain, stick around, because there’s more following the gallery thumbnails. Be sure to scroll down. I’ll tell you a little bit about other sections of the Refuge and even offer a few photos of the wildlife. As I mentioned above, you’re likely to see wildlife as soon as you enter the grounds… we did. After all, this is a Wildlife Refuge. In the six mile drive from the entrance gate to Charons Garden Wilderness, we passed three herds of bison and longhorns, as well as lots and lots of wild turkey. We missed out on any elk on the day we were there, but they are around. The elk herd now numbers about 800 and white tailed deer about 450. Many smaller mammal species also live in the Refuge, including coyote, the Nine-banded Armadillo and the Black-tailed Prairie Dog. 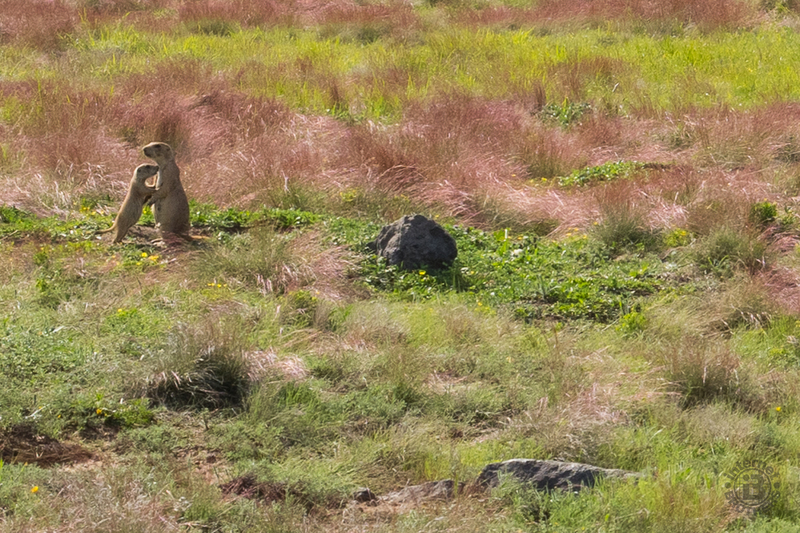 The prairie dogs really are quite fascinating. I tried to think back if I’ve ever seen them anywhere before. Soon after we left Elk Mountain, we passed an area along the side of Hwy 49 known as “Turkey Creek Prairie Dog Town.” And a town it is. In the short time we stopped, I noticed probably two dozen of the little critters nervously prancing about near their protective burrows. They call the prairie dog sound a “bark,” but it really sounds more like a chirp to me. It’s all fun and games until someone steps in a hole and breaks an ankle. Just ask the bison. After our hike, and visit to Prairie Dog Town, we stopped at the park Visitor Center to inquire about other interesting sightseeing opportunities in the Refuge. Located at the junction of highways 49 and 115, the Visitor Center is quite nice, and features dioramas and hands-on exhibits that complement the fine art, sculptures, and taxidermy. Maps, books, pamphlets and other info about the wildlife and wildlands are available in the bookstore and gift shop. Environmental education classes covering most natural resources related subjects can be scheduled at the Visitor Center or through the Wichita Mountains Friends Group. We still had a few hours available before we had to resume our long eastward drive, so a very helpful ranger recommended we go visit Jed Johnson and Rush Lakes, and the CCC era fire tower that overlooks the terrain. We took about a one mile round trip walk past the two lakes to the tower. Finding a very comfortable patch of grass in a field of exquisite balsamroot, we stopped to smell the flowers, breathe the fresh air, and relish the beautiful scenery. The only negative sight the entire day was an apparent blight that had killed all the trees that surround the two lakes along this trail. It’s really a shame too. The trail is quite scenic as it is, but if the trees were still healthy it would be even more remarkable. The ranger also recommended we take a drive to the top of Mt. Scott, the highest point within the refuge. The CCC built the road that winds several times around the pyramid shaped mountain on its way to the summit. The ranger was right, the views are indeed illuminating. Off to the east are the town of Lawton, Lake Lawtonka, the army base, and hundreds of wind turbines harnessing the renewable wind energy as far as you can see. On the west side of the rocky summit, past the Charons Garden Wilderness, the Oklahoma plains roll on forever… all the way to the horizon. All in all, a thoroughly enjoyable day. I just learned that several of the Wichita Mountains Wildlife Refuge staff were seriously impacted by the devastating Memorial Day weekend flooding in Oklahoma and Texas. The Wichita Mountains Friends Group linked above has set up a means of helping those who help us. The Refuge is a cornerstone that brings peace and enjoyment to our hectic lives. Please consider making a donation for our friends in their time of need.